September 12th, 2011 10:28 AM by Lehel S.
The U.S. is caught up in "refi" madness. Among the measures President Obama may unveil in his major policy speech this week is a plan to make mortgage refinancing easier, so more households can benefit from ultralow rates. Various proposals for this have been circulating for some time; last June, Morgan Stanleydubbed its version a "Slam-Dunk Stimulus." But there is a catch. Many mortgage holders aren't able to refinance because they can't afford the fees, no longer qualify for a loan or their mortgage is more than the home is worth. 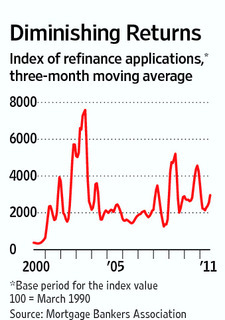 As a result, refi activity has been fairly weak despite the 4.3% average rate for a 30-year, fixed-mortgage. On Wednesday, the Mortgage Bankers Association will release its weekly mortgage application data; as of last week, its refi index was down 33% from the same period a year ago and even further below peak refi activity in 2003. This despite the fact that more than three-quarters of borrowers with a mortgage backed by Fannie Mae or Freddie Mac had a rate of 5% or more as of June, according to one recent policy proposal. Hence the desire for government intervention. The hope is it could benefit as many as 30 million households and free up $20 billion to $70 billion a year by reducing interest payments, according to various proposals. But that money isn't likely to provide much of a stimulus. For one, there is no guarantee it will be spent; balance-sheet impaired households may pay down debts or boost savings. And, even if people did spend every penny, even $70 billion would still amount to less than 0.5% of the nation's $15 trillion gross domestic product. Many mortgage holders aren't able to refinance because they can't afford the fees, no longer qualify for a loan or their mortgage is more than the home is worth. 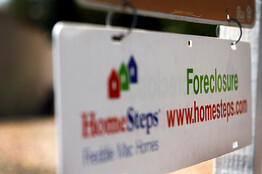 Above a foreclosure sign in Phoenix, Ariz. True, shoring up household finances has benefits. "What we're doing is restructuring household balance sheets," says Columbia Business School Professor Chris Mayer, co-author of one policy proposal. The quicker debt burdens can be lowered, the better for the economy's long-term health. Such a program isn't without cost, though. Banks and other investors currently holding mortgage bonds would suffer. The taxpayer, through Fannie and Freddie, would also take an up-front hit. And, should any program also include debt forgiveness, there would be significant moral hazard.